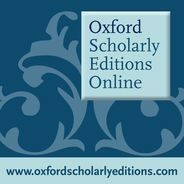 Oxford Scholarly Editions Online (OSEO) is a major publishing initiative from Oxford University Press, providing an interlinked collection of authoritative Oxford editions of major works from the humanities. Scholarly editions are the cornerstone of humanities scholarship, and Oxford University Press’s list is unparalleled in breadth and quality. Who doesn’t like a centenary? Whether solemn, festive, or celebratory, a centenary (or centennial, for North Americans) can be very instructive, whether conducted individually or collectively. It is a way of acknowledging—often honouring—the past and, at the same time, reassessing the present and imagining the future in the context of the previous event or exemplary person. One hundred years should be sufficient time for substantive reconsideration, both historical and cultural. For the centenary-minded, 2018 offers almost too many occasions, including the horrific battles of World War I that culminated in the signing of the Armistice on 11 November, and the execution of the Romanov royal family (Tsar Nicholas II, his wife Alexandra, and their five children) and their servants. One could celebrate, instead, one hundred years of women’s suffrage in Great Britain for most women over the age of 30 and Canada (for federal elections, and excluding women the province of Quebec). On 28 December 1918, Constance Gore-Booth Markievicz, a member of Sinn Féin, became the first woman elected to the British House of Commons (at the time, she was an inmate in London’s Holloway Prison for her role in the Easter 1916 Uprising). Americans may be unaware that it is the centenary of daylight savings time in their country (British Summer time had been enacted two years earlier—another war-time measure, like personal income taxes, that was never repealed). Depending on one’s pleasures and cultural commitments, 1918 births to be commemorated include those of Louis Althusser, Pearl Bailey, Alec and Eric Bedser, Ingmar Bergman, Leonard Bernstein, Ray Charles, Rita Hayworth, Skitch Henderson, Katharine Johnson, Nelson Mandela, Spike Milligan, Birgit Nilsson, Aleksandr Solzhenitsyn, Muriel Spark, Mickey Spillane, Ted Williams, and Hermann Zapf. Ardent readers may wish to mull over what it means to have had one hundred years of Willa Cather’s My Ántonia, Booth Tarkington’s The Magnificent Ambersons, Oswald Spengler’s The Decline of the West, L. Frank Baum’s The Tin Woodman of Oz, Wyndham Lewis’s Tarr, Winston Churchill’s A Traveller in War Time, Wilfred Owen’s Collected Poems, Lytton Strachey’s Eminent Victorians, and Marie Stopes’s Married Love, which was banned for “obscenity” until 1931. There is also the centenary of Poems by Gerard Manley Hopkins to consider. When Hopkins died in 1889, his poetry had been read by a mere handful of friends and family members. He had submitted his magnificent ode, ‘The Wreck of the Deutschland’, to The Month, a Jesuit journal, but the editor declined the opportunity to publish it. Otherwise, Hopkins, who had joined the Society of Jesus in 1868, refused to consider publication lest it detract from his religious responsibilities and spiritual commitments. The survival of Hopkins’s manuscripts was due to the stewardship of Robert Bridges, the Poet Laureate in 1918, and a friend of Hopkins since their Oxford days. For Bridges, who did not entirely approve of Hopkins’s lavish experiments in meter, word usage, and genre—much less the way in which Hopkins marked up his poems to indicate how they should be read aloud—selecting, editing, and publishing Poems was a labour of respect and fellowship rather than admiration. For Bridges, who did not entirely approve of Hopkins’s lavish experiments in meter, word usage, and genre—much less the way in which Hopkins marked up his poems to indicate how they should be read aloud—selecting, editing, and publishing Poems was a labour of respect and fellowship rather than admiration. Bridges’s preface is cautious to the point of antagonistic. The reader is warned about Hopkins’s “peculiar scheme of prosody”, the “occasional affectation in metaphor”, rhymes that are either “peculiar” or “repellant”—or both—and lack of “a continuous literary decorum”. Not only is the reader cautioned about Hopkins’ eccentricities, what Bridges terms the “Oddity and Obscurity” that can too easily offend or discourage, but told bluntly, “when he indulges in freaks, his childishness is incredible”. Perhaps because of the editor’s trepidations, that first volume of Hopkins’s poetry, published with the help of Hopkins’s nephew Gerard Hopkins, an editor at Oxford University Press, was anything but a bestseller—the initial print run of 750 copies was never exhausted. For the discerning reader, however, the poems were a revelation. Demonstrated by her letters, Virginia Woolf, for example, couldn’t wait to share the startling texts with her friend and former Greek tutor, Janet Case: “Have you read the poems of a man, who is dead, called Gerard Hopkins? I liked them better than any poetry for ever so long[. ]” Six months later, Woolf loaned Case her copy of Poems, with the caution, “Some are very lovely and quite plain; others such a mix of beauty and horror that it takes hours to sort them—for instance the long one on the wreck”. It was the second edition of Poems, begun by Bridges and completed by Charles Williams after Bridges’ death in 1930, that garnered the attention of academics such as Humphry House and marvelling young poets such as W. H. Auden and Dylan Thomas; the response of established poets such as T. S. Eliot and Ezra Pound was lukewarm at best. Currently, the poems are being re-edited for the Collected Works of Gerard Manley Hopkins. Featured image credit: Old Books by jarmoluk. CC0 via Pixabay. Lesley Higgins is a Professor of English at York University, Toronto, whose research and teaching interests include modernist and Victorian literary culture, gender studies and feminist critique, textual studies, and poetry. For Oxford University Press, she is co-general editor of the eight-volume Collected Works of Gerard Manley Hopkins. Her essays can be found in Southern Review, College Literature, Gender in Joyce, Rethinking Marxism, English Literature in Transition, Victorian Studies, and The Hopkins Quarterly.